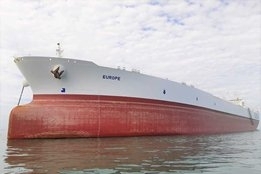 Euronav says it is considering a number of arrangements to secure its IMO 2020 compliant fuel supply ahead of next year's new global suffer cap, and there are plenty of signs to suggest blending its own VLSFO bunkers is one of them. "When it comes to sourcing fuel there are three factors that are important: quality, quantity, and price," Brian Gallagher, Euronav's Head of Investor Relations, told Ship & Bunker. "We want to be compliant and this isn't going to end on January 2, 2020, so it's important to consider the longer term too." Euronav is the world's largest independent tanker company with a fleet of 72 vessels that burn a million tonnes of fuel annually. The shipowner remains unconvinced over the economics of using HSFO and scrubbers when the new sulfur cap comes into force, while the sheer size of its bunker consumption means it has plenty to gain by burning 0.50%S VLSFO instead of more expensive MGO. And while VLSFO is expected to tick the box for price, plenty has been said about the potential for cross compatibility problems between VLSFOs from different supply sources, or even from the same supplier between stems. This is also why many predict initial demand for VLSFO will be light and MGO to emerge as the fuel of choice for next year, in turn casting doubt over how much VLSFO product will be available, and where. Firming up a private, consistent VLSFO fuel supply source would address both these issues. It is perhaps no surprise then, that Gallagher says Euronav "has maximum optionality" via its two 440,000 dwt ULCCs, Oceania and Europe, for storage purposes. AIS data shows Oceania is currently anchored off Malta, while Europe has spent over a year in waters around Singapore. And while he was keen to stress that it was working with refiners and oil companies on a number of options, last month Euronav hired fuel oil trader and blender Rustin Edwards as its Head of Fuel Oil procurement. He counts Hess, Chevron and Cargill among his previous employers. At Euronav, Edwards is understood to be looking to develop not only a fuel sourcing solution but the potential for a blending operation too. While blending their own bunkers will certainly not make sense for many shipowners, for an operation the size of Euronav it could well be an attractive route to further cost savings, at least if what we learned during IP Week last month is any indication. "Over the last 7 days I have seen the same 0.5% product 3 times: From the Refinery as cargo; From a supplier; From a 2nd supplier after blending. The price spread was over $50 between the 3," NSI's Paul Hardy said in a recent update as part of its 2020planning service. "Funnily enough the most expensive was the one that had been blended and so in theory should have been the cheapest." If it does blend its own bunkers, Euronav would follow in the footsteps of fellow scrubber sceptic Maersk in taking VLSFO supply into its own hands.